I first learned lemurs existed in high school zoology class. People always ask me “why lemurs?” Why was this the animal species that I chose to study? I don’t have an exact answer for this. These animals completely captivated me. I love that they are all so vastly different – from large aye-ayes to tiny mouse lemurs. I am fascinated by their behaviors such as stink fighting and scent marking. I’m intrigued by their little toenails that resemble our own, their fuzzy faces and the way their gaze follows you with curiosity. I was heartbroken to find they face possible extinction due to anthropogenic activities. Truth is, I love all animals. But I felt lemurs were the most at risk and needed one more conservationist on their side. Big-nosed chameleon (Calumma nasuta) about an inch long. While I was waiting for my permits to be approved, I decided to pay to be a tourist for a day at Ranomafana National Park (RNP). I went to the park entrance, paid my fees, hired a guide and we were on our way. 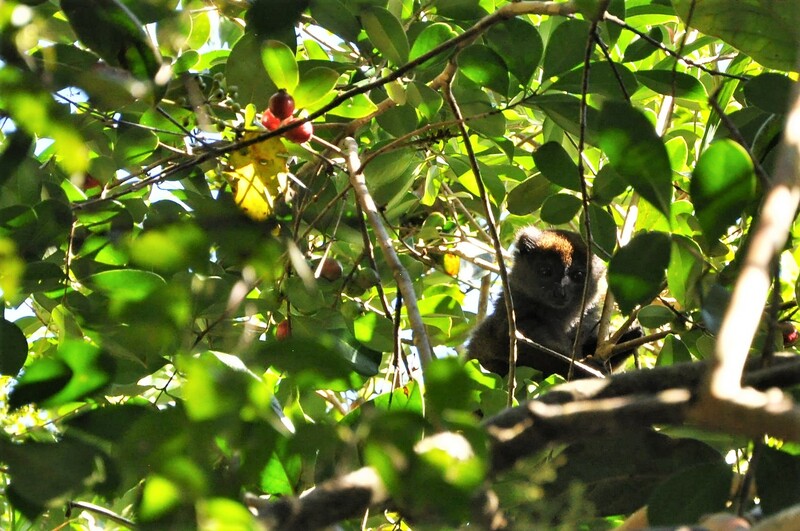 Within the first hour we had already seen three groups of lemurs. I was exhausted already because the terrain is mountainous and arduous. 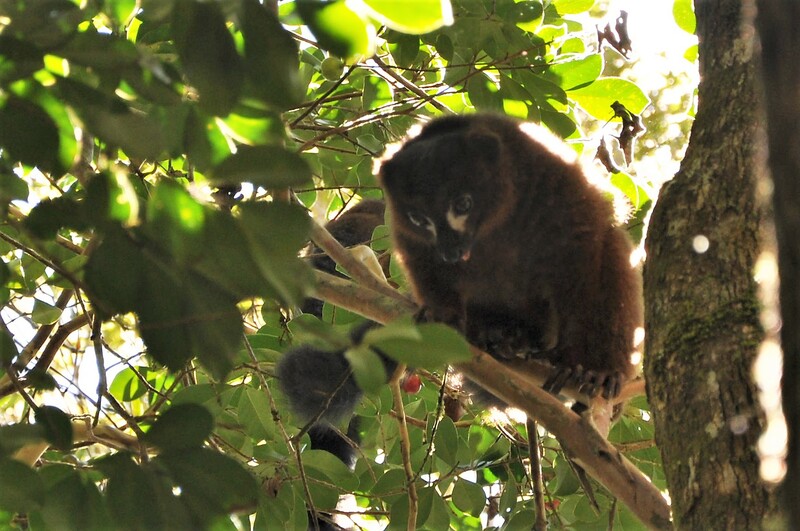 I was lucky enough to see the red-bellied lemur (Eulemur rubriventer – IUCN Red List Status: Vulnerable), the brown lemur (Eulemur fulvus– IUCN Red List Status: Near Threatened), Milne-Edward’s sifaka (Propithecus edwardsi– IUCN Red List Status: Endangered), lesser bamboo lemur (Hapalemur griseus– IUCN Red List Status: Vulnerable) and the golden bamboo lemur (Hapalemur aureus– IUCN Red List Status: Critically Endangered). If you were on your own wandering about the forest, you certainly would not see this many species. There are multiple guides in the forest at a time and they call each other when they find a group. It is a very tourist-rich area and the guides are quite coordinated at ensuring tourists see what they want to see. 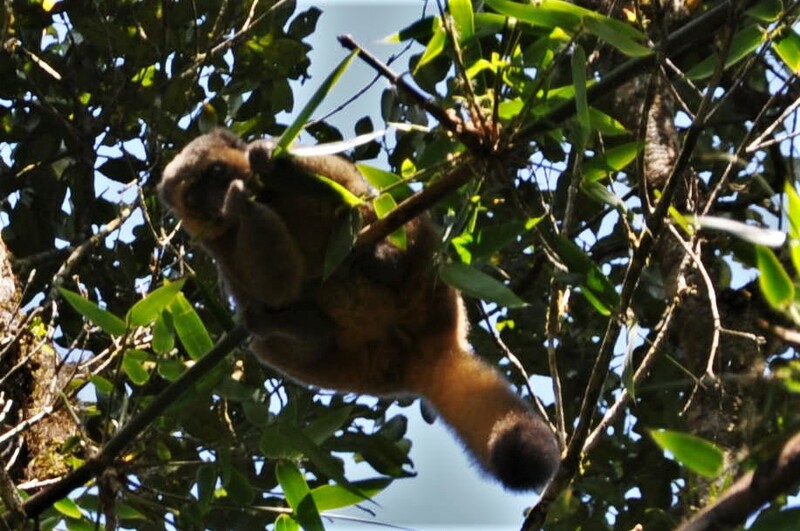 My guide and I were watching the golden bamboo lemurs for a while, but they were high up in the trees so we decided to move on. Then we heard a lot of noises and returned to find two groups of golden bamboo lemurs fighting on the ground (potentially over territory). I was lucky to have gotten caught up in the midst of this spat and managed to capture some of the squeals and grunts on camera. The videos aren’t a great visual, but mostly uploaded for the audio. Madagascar is one of the leading biodiversity hotspots on Earth. Lemurs are only found in Madagascar and its surrounding islands. 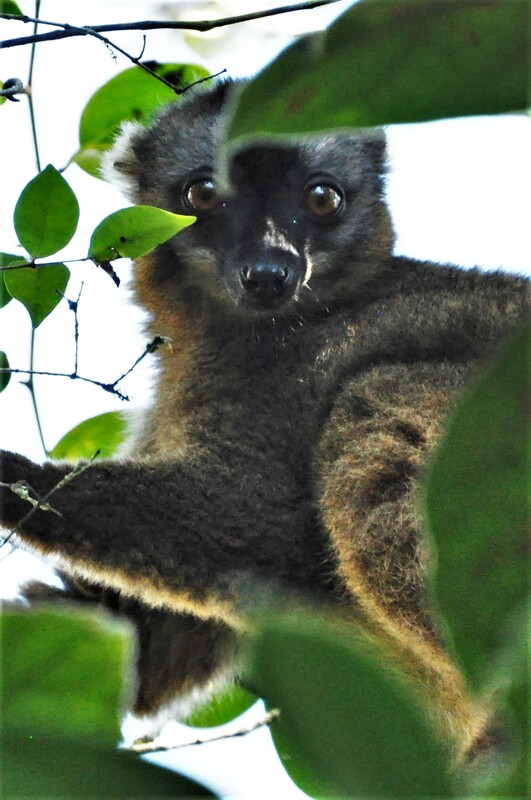 Of approximately 100 lemur species, 94% are considered threatened or have declining populations. This makes lemurs the most threatened mammal group in the world. It was hard for me to perceive that all lemurs could go extinct due to preventable activities. Their biggest threats are deforestation due to slash and burn agriculture, habitat fragmentation that causes population isolation, and bushmeat hunting. 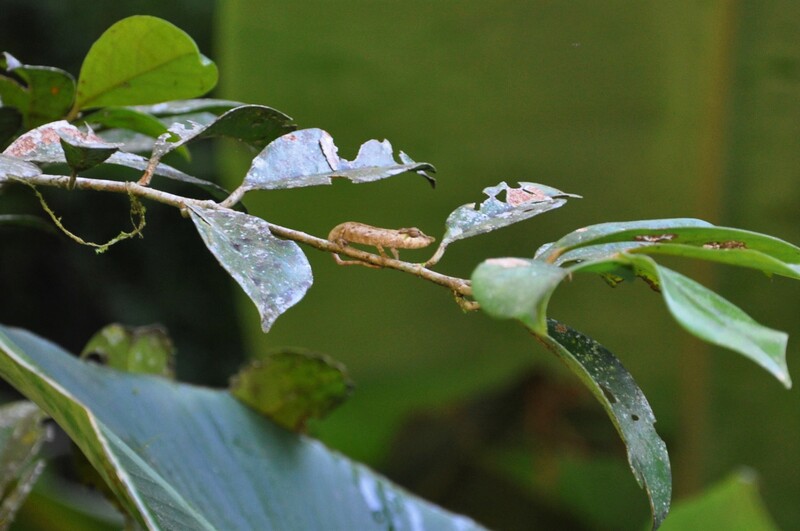 Madagascar has lost 80-90% of its forests since human colonization on the island. The Malagasy people do not cut forests and hunt lemurs out of mal-intent – they do it because it is the only way they can survive. Madagascar is among the top 10 poorest nations in the world. Their entire livelihood is surrounded by working to feed their families. 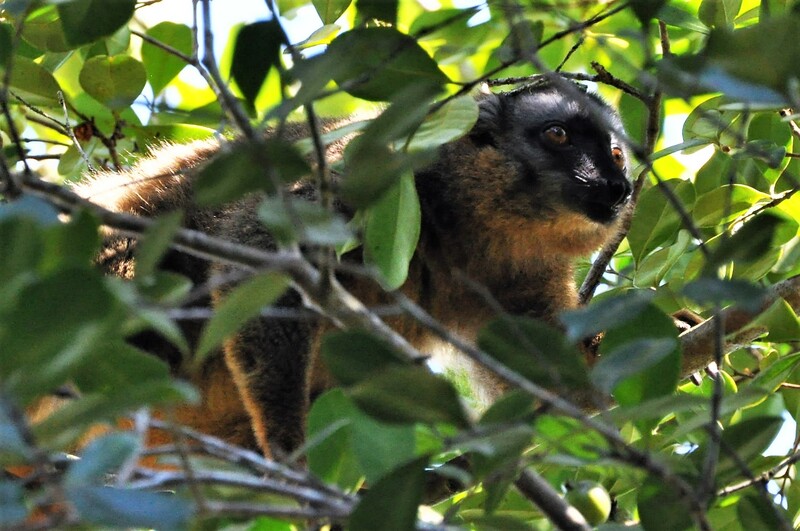 Brown lemur (Eulemur fulvus) in RNP. 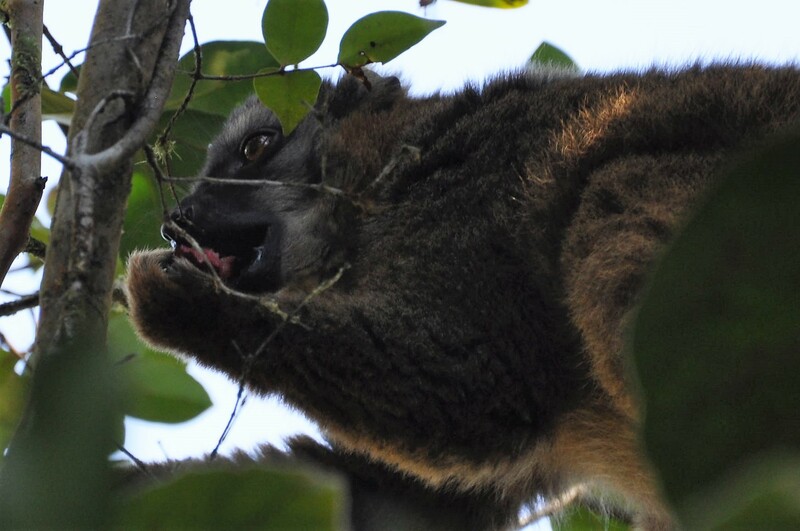 A brown lemur (Eulemur fulvus) feeding on red guava – a hot commodity among many lemur species. 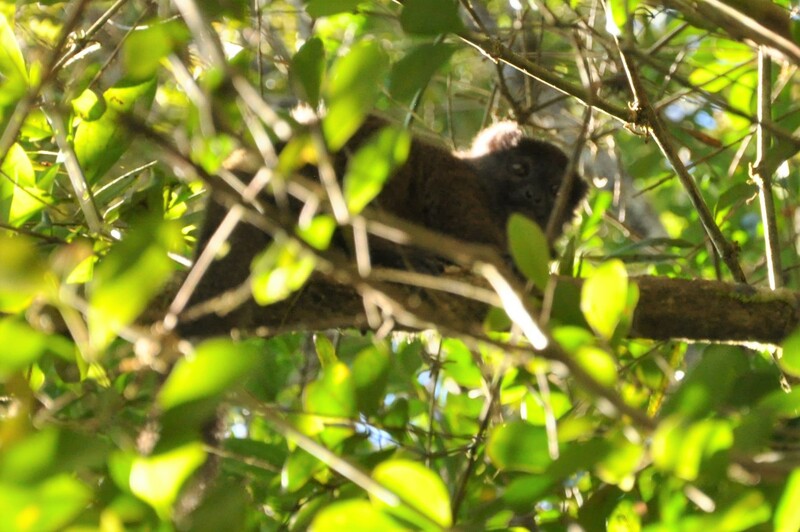 A brown lemur has spotted me (Eulemur fulvus). 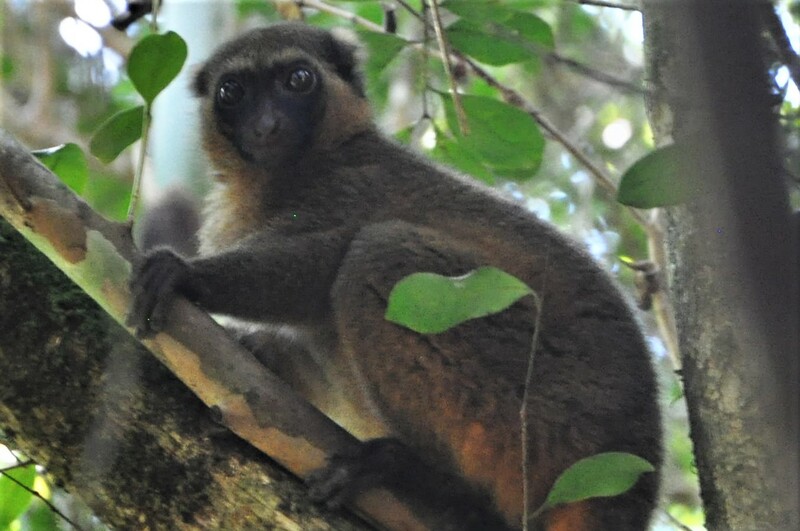 Luckily, Madagascar has created a handful of national parks, special reserves and protected areas that conserve habitat for remaining lemur species. However, many of these areas are not well guarded and are often still exploited by indigenous populations. Protected areas are good for the lemurs, but bad for the local people because it limits the amount of resources available to them. Many locals rely on forest resources to make a living. As I’ve described before, many Malagasy people collect leaves, wood, honey and meat from the forests to sell. Solving lemur conservation issues is not as simple as creating more protected and well-guarded areas. Conservation plans must also incorporate helping the Malagasy people find sustainable sources of income. 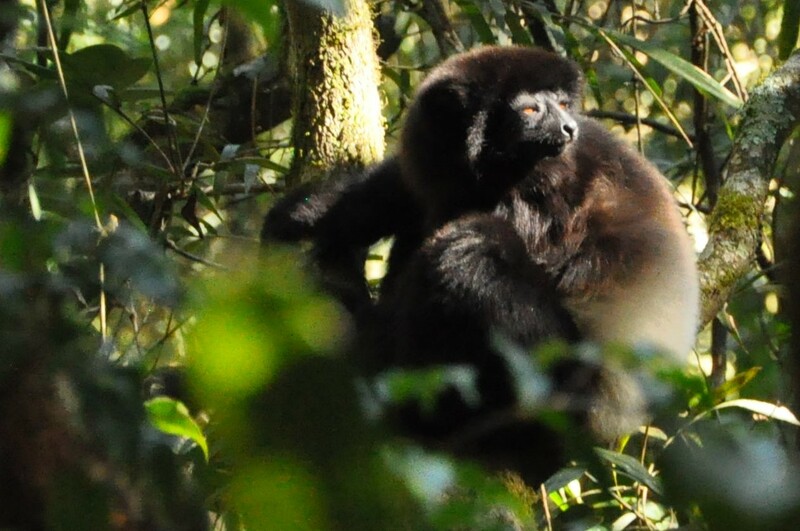 Milne-Edward’s sifaka (Propithecus edwardsi) squinting into the bright sunlight. Milne Edward’s sifakas have captivating bright eyes. This Milne Edward’s sifaka wears a tracking collar. 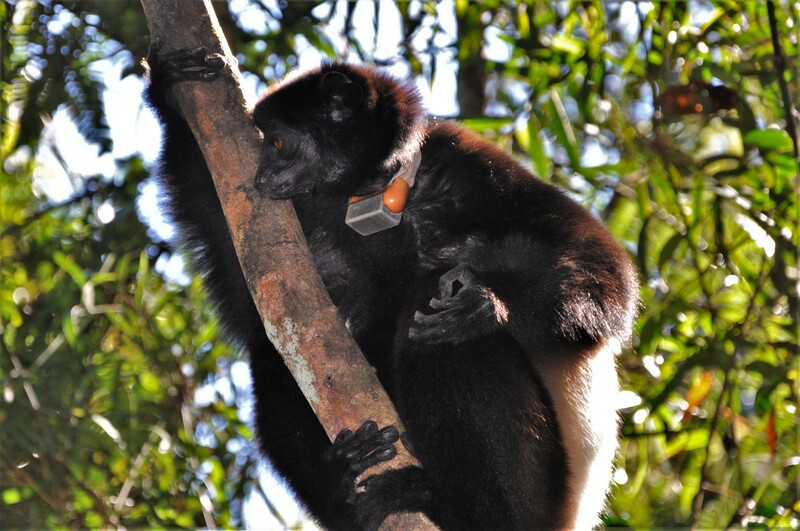 Many lemurs in RNP wear these harmless collars for researchers to track their movements. While I am staying at CVB (Centre Val Bio), there are many Malagasy people employed to cook, clean, guard or run the research station. CVB is an incredible resource that does more work than I can describe in a single blog post, including education, community health and research. I believe their most important role is incorporating the community, which is an enormous aspect of international work. For my research, a portion of the money I’ve raised goes towards paying locals to help me with the project. Many of my grants are unable to cover this expense and I am funding this out of pocket. 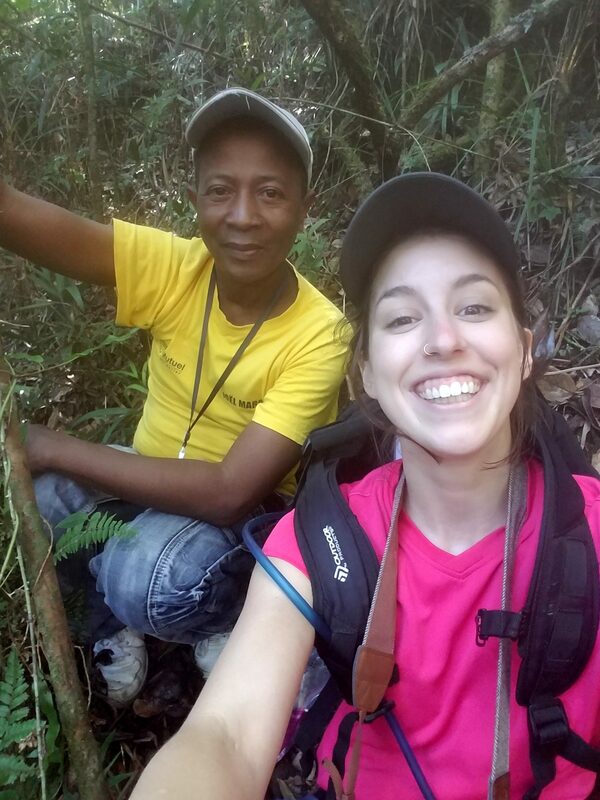 When I’m in the field doing research, I’ll be hiring a cook, a handful of porters, a driver, two guides, a local, and, of course, my student Mirana to help me. In other words, through CVB, research projects like mine help provide a sustainable source of income for many Malagasy locals. My guide, Jean Claude, who helped me find lemurs on my day as a tourist. 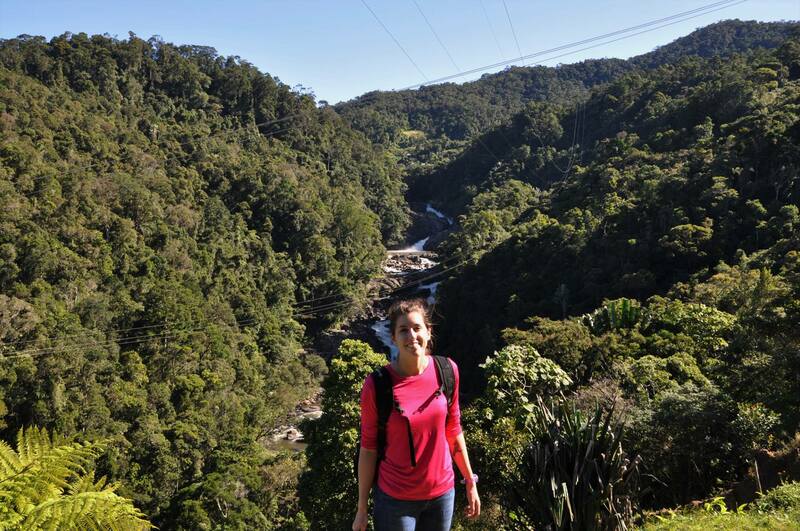 A great view of the river that runs through Ranomafana National Park. “Rano” is Malgache for “water”; mafana is Malgache for “hot.” Malagasy people found hot springs and named the town “Ranomafana.” You can see the park is a very mountainous, forested landscape. With my team, I will be studying how lemur biodiversity abundance and richness changes with different habitat factors in Ranomafana National Park. I will be looking at the microhabitat scale (such as tree diameter, height, canopy width, canopy cover, etc.) and the landscape scale (such as point distance to nearest road, village, forest edge, park edge, etc). I will be also collecting information on any signs of disturbance such as cut trees, lemur traps, fires, livestock droppings, etc. Hopefully, we will not find any signs of human disturbance since RNP is well-guarded. Lemur biodiversity has been studied here previously, and it is important to continue to monitor lemur populations over time. Recognizing how different species are affected by and adapt to different habitat factors helps conservationists better understand how to implement successful species-specific conservation plans. The critically-endangered golden bamboo lemur only found in Ranomafana National Park Madagascar. Just wanted to make a quick correction. When I said Eulemur fulvus, brown lemur, what I meant was Eulemur rufifrons, the red-fronted lemur. 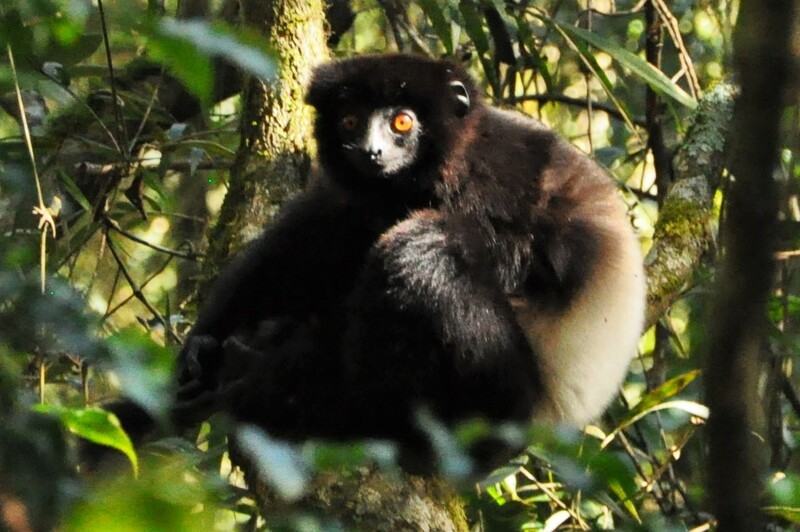 Previously this species was named Eulemur fulvus rufus and is still commonly identified by its old name. Caitlyn, we almost feel as if we are there in the forest with you. Such important work to be doing! The videos are captivating. Thank you for including us in your research and richly colored travels.